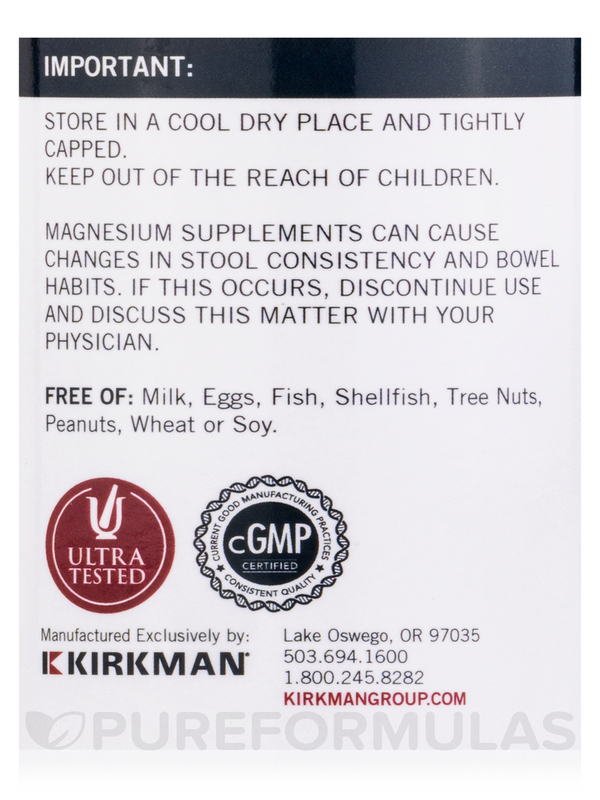 I've taken Magnesium Bisglycinate Chelate by Kirkman for years without any of the bowel issues that can be associated with other forms of magnesium! I have searched far and wide to find a magnesium supplement that I can easily swallow. Magnesium Glycinate by Kirkman is it! And, the glycinate form is the one recommended by my doctor! Magnesium Glycinate by Kirkman is very well absorbed. This was evident after having my blood tested for magnesium levels. I trust the KIRKMAN company and have felt more calm after taking Magnesium Glycinate. 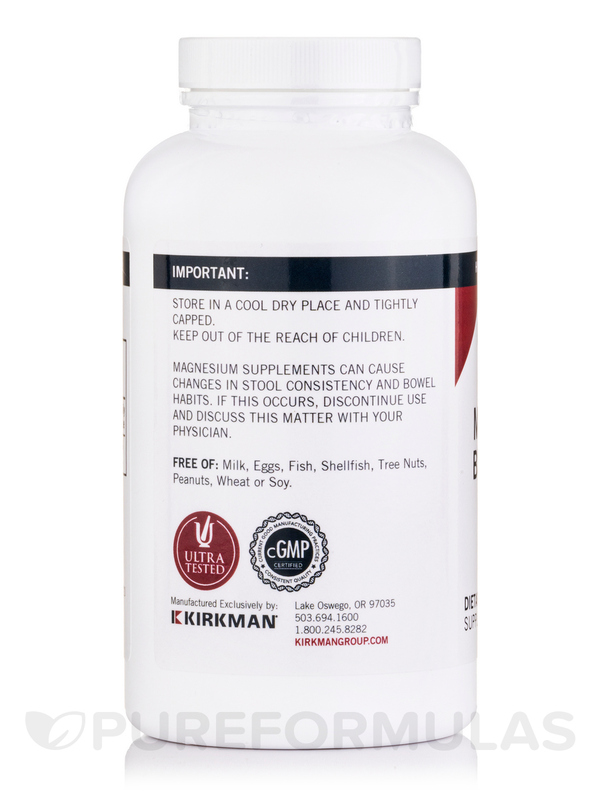 Kirkman® offers Magnesium Glycinate® capsules in a hypoallergenic formulation for individuals with special requirements and sensitivities. Magnesium glycinate is a form of magnesium that is easier to digest and absorb than some other forms of magnesium. 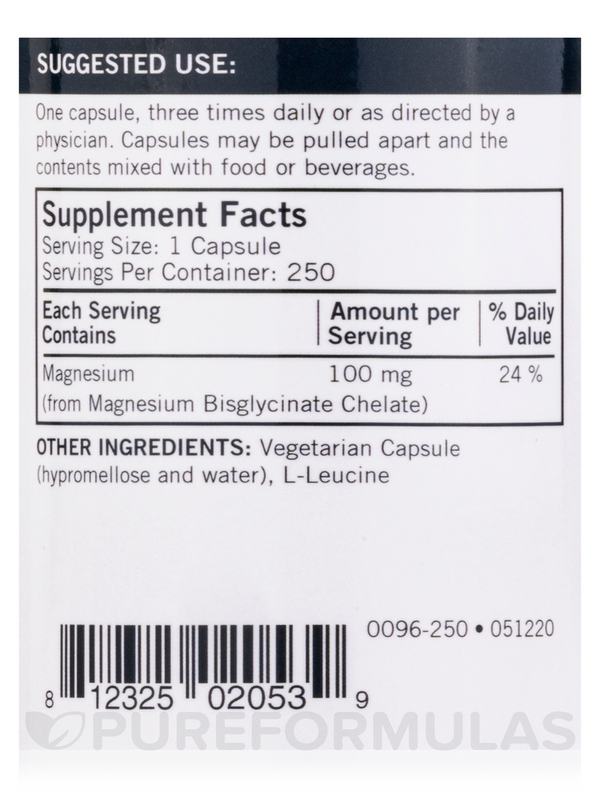 Ingredients: Magnesium bisglycinate chelate‚ magnesium oxide‚ L-Leucine‚ plant cellulose capsule. Free of sugar‚ starch‚ soy‚ wheat‚ casein‚ gluten‚ milk‚ egg‚ preservatives‚ yeast‚ gelatin‚ flavorings‚ colorings‚ peanuts‚ tree nuts or fish. 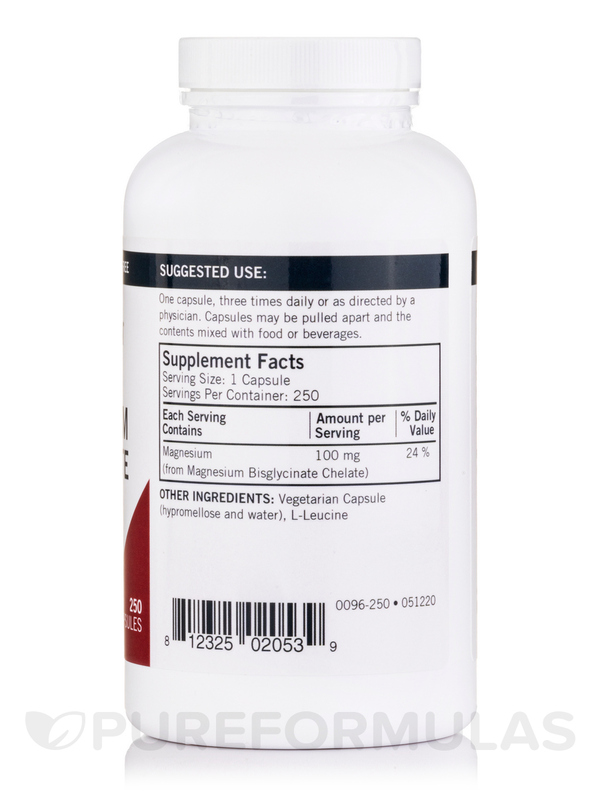 One capsule‚ three times daily or as directed by a physician. Capsule may be pulled apart and the contents mixed with food or beverages. Magnesium supplements can cause changes in stool consistency and bowel habits. If this occurs‚ discontinue use and discuss this matter with your physician. Store in a cool‚ dry place and tightly capped. Keep out of reach of children. Wow Wow Wow! Fantastic Magnesium! 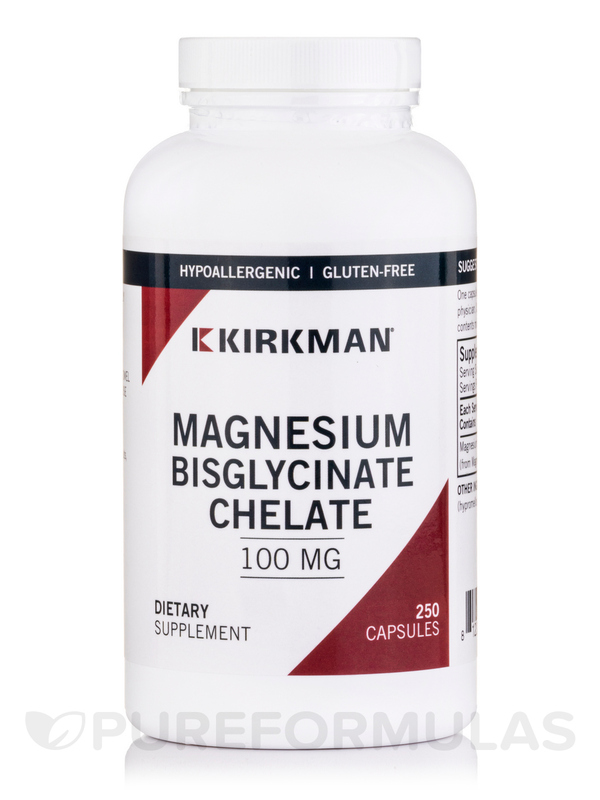 Magnesium Bisglycinate Chelate by Kirkman is my new number one. I am very impressed with not only the quality of Kirkman products, but the fact their labs check every single batch for over 950 Contaminants, Bacteria, Viruses & Parasites. I suffer from terrible Multiple Sclerosis and my Neurology team has told me I must keep my Vitamin D3 and Magnesium levels up. I have tried many brands, from cheap, to most expensive, and Kirkman is it! Once again PureFormulas delivers a #1 top rated product! Love the fast free priority shipping they offer. PureFormulas is the "Epic Super Supplement Seller" in my book! Best form of Magnesium around! Note one con to note! 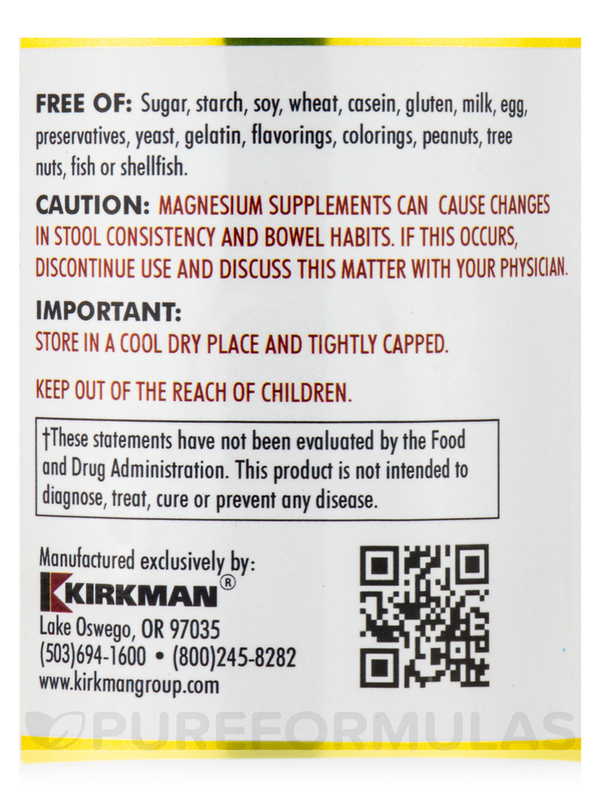 Magnesium Glycinate by Kirkman is a muscle relaxant, sleep aid, and aid to fight constipation. I love the large bottle. You get more for your money! There is nothing that I dislike. Great product.! Great price!